Honeysuckle Veterinary Rehabilitation Centre was established in 2004 and was one of the first Small Animal Veterinary Rehabilitation clinics in the UK. We offer Physiotherapy at our Honeysuckle Veterinary Rehabilitation Centre. We believe in a holistic approach to rehabilitation, promoting exercise and health management. 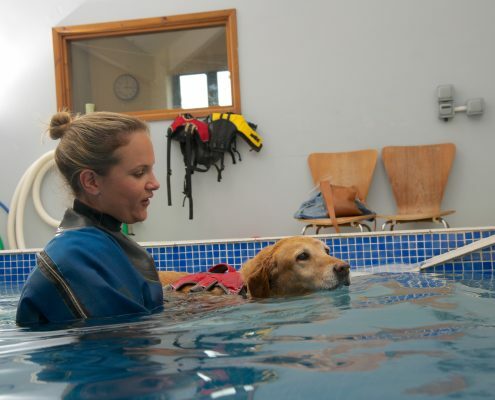 We also offer Hydrotherapy treatment, which is carried out by a Registered Veterinary Nurse specialised in rehabilitation. The team consist of a Veterinary Surgeon, a Chartered Physiotherapist, who specialises in Veterinary Rehabilitation and a Registered Veterinary Nurse. The purpose built rehabilitation centre is well equipped with a 8 X 10ft heated hydrotherapy pool with counter swimming jets and drying facilities, water based treadmill as well as a range of physiotherapy equipment. Services also include electro-acupuncture and traditional canine acupuncture. 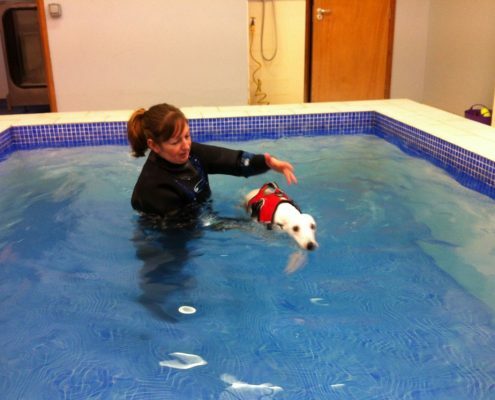 We adopt a multidisciplinary approach to rehabilitation and work closely with owners, vets and other therapists. All animals are either referred directly to us by your existing vet, or we obtain their permission and any relevant medical history. We report back to your vet to ensure that we are all working together, and that your dog’s medical records are kept up to date.